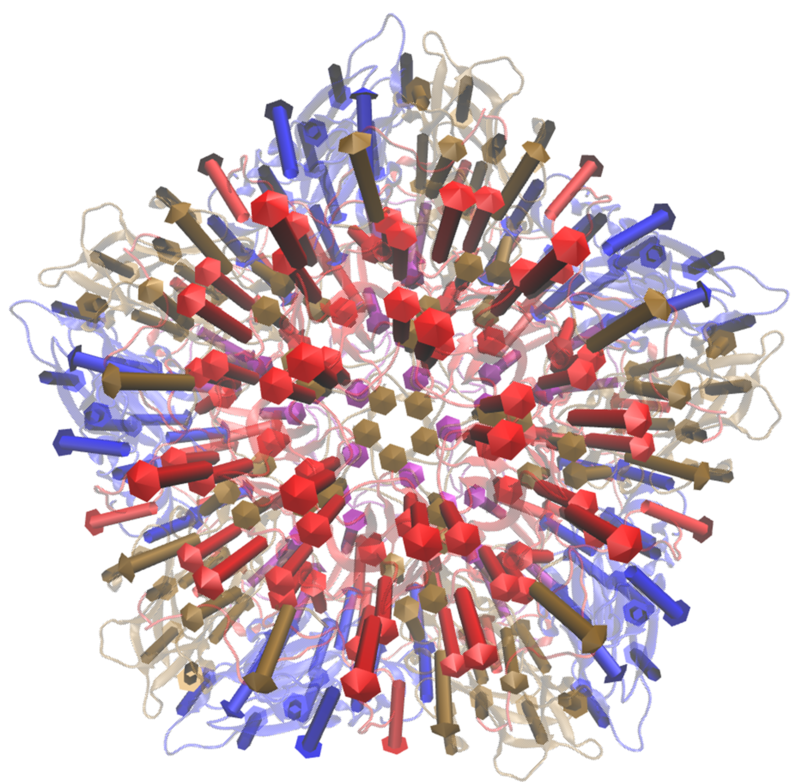 Enterovirus 71 (EV-71) is a human pathogen that predominantly infects small children. The capsid is icoshedral and contains 60 protomer units. In a mature capsid the protomers are assembled as a set of 12 pentamers. Each protomer contains a single copy of the proteins VP1-VP4. During infection, the virus capsid expands to release its RNA into the host cell. This expanded capsid is known as the A-particle. 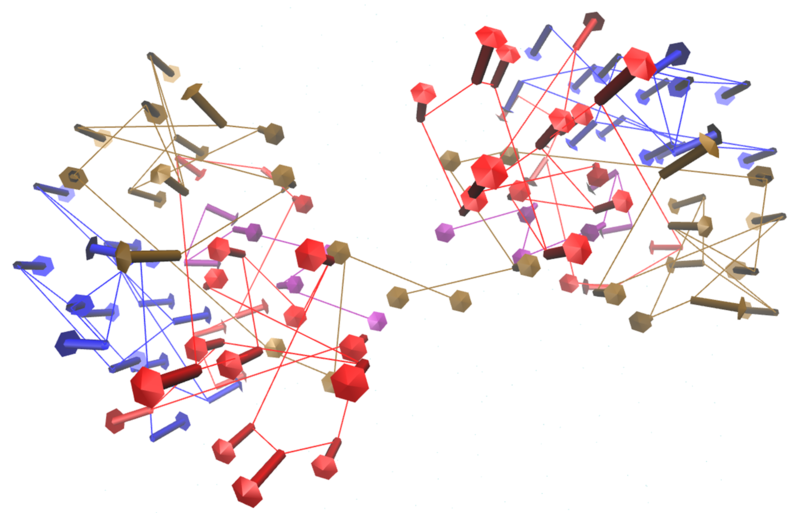 In this tutorial we will apply the ANM model to a single pentamer of the mature EV-71 capsid. We aim to identify the normal modes that contribute to the conformational changes within a pentamer during capsid expansion. We will run all scripts from the ModeTask directory. Download the 3VBS biological assembly (3VBS.pdb1) of the mature EV-71 capsid from the PDB. Use the split_states 3VBS command to visualise the full capsid. Save the capsid: File – Save Molecule – Select the first five states. Save as EV71_Pentamer.pdb into the ModeTask/Tutorial directory. Each protomer has four subunits: VP1-VP4. VP4 is an internal capsid protein. The estimated run time to perfom ANM on a complex of 4210 residues, using Mode Task is 25 hours. For the sake of this tutorial we will use the coarseGrain.py script to construct a lower resolution pentamer. Download the 4N43 biological assembly (4N43.pdb1) of the A-partcile EV-71 capsid from the PDB. Use the split_states 4N43 command to visualise the full capsid. Save the capsid: File – Save Molecule – Select the first five states. Save as Apart_Pentamer.pdb into the ModeTask/Tutorial directory. The MODE-TASK package is designed to analyse both single proteins and larger macromolecules such as a virus capsid. The ANM.cpp script contructs an elastic network model on all CA or CB atoms in a given PDB file. This is ideal for smaller protein complexes. For larger protein complexes, the coarseGrained.py script can be used to construct an additional coarse grained PDB file. EV71_CG3.pdb and EV71_CG4.pdb : Two separate coarse grained pdb files that have the coordinates of selected CB atoms from residues that are equally distributed across the complex. As an example, EV71_CG3.pdb is shown in the figure below. Note that, the same set of 122 atoms from each protomer were selected for CG3, likewise, the same set of 54 atoms from each protomer were selected for CG4 – thus the symmetry of the pentamer is retained. 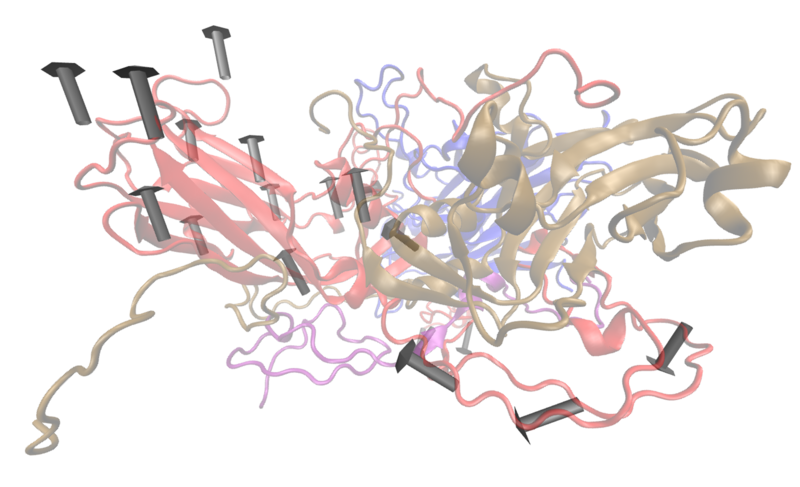 Left) Crystal structure of the EV71 Pentamer (3VBS). 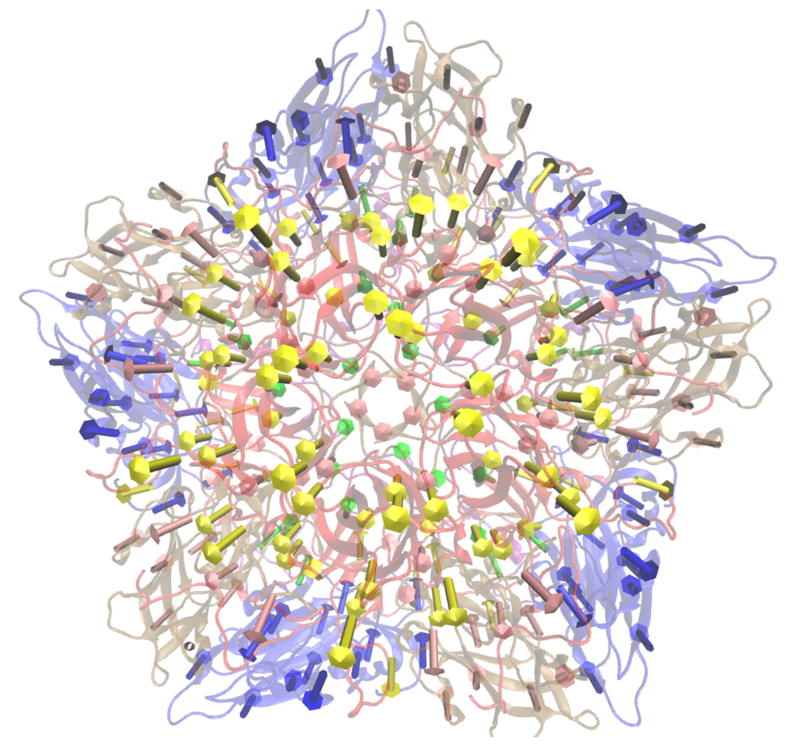 Right) EV71_CG3.pdb contains 610 CB atoms from 4210 total residues. The ANM.cpp script accepts a PDB file and a cutoff distance. The script constructs the Hessian matrix connecting all CB atoms within the specific cutoff radius. The script then performs singular value decomposition to return the eigenvalues and eigenvectors of the Hessian matrix. W_values.txt: A list of 3N eigenvalues of the system. Eigenvalues are ordered from slowest to fastest. 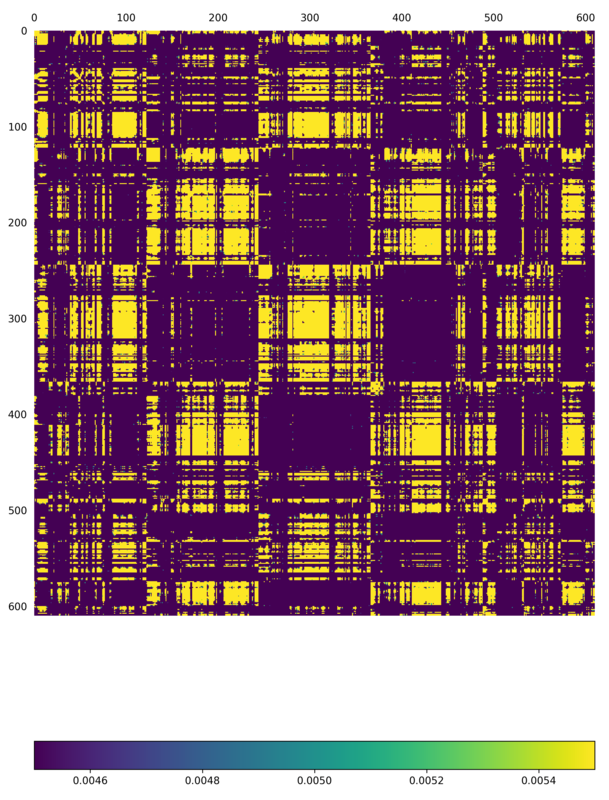 VT_values.txt: A 3Nx3N list of the eigenvectors for each mode. Eigenvectors are printed as a set of rows. 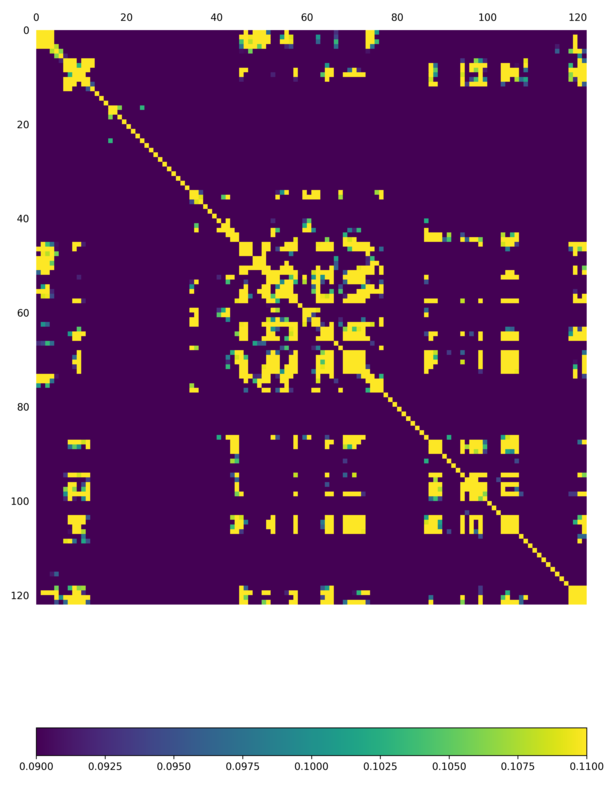 U_values.txt: A 3Nx3N list of the eigenvectors for each mode. Eigenvectors are printed as a set of columns. For each model we will now identify the modes that contribute to the conformational change of a pentamer during capsid expansion. We will then compare the modes from the respective models and determine if the additional coarse graining affected the ability to capture such modes. To determine if our modes overlap with the direction of the conformational change, we must first determine the conformational change between the crystal structures of the mature and A-particle pentamer. The conformationMode.py scripts take two UNALIGNED pdb files and the set of all eigenvectors determined for the complex. The script aligns the structures, calculates the known conformational change and then identifies which modes contribute to the change. 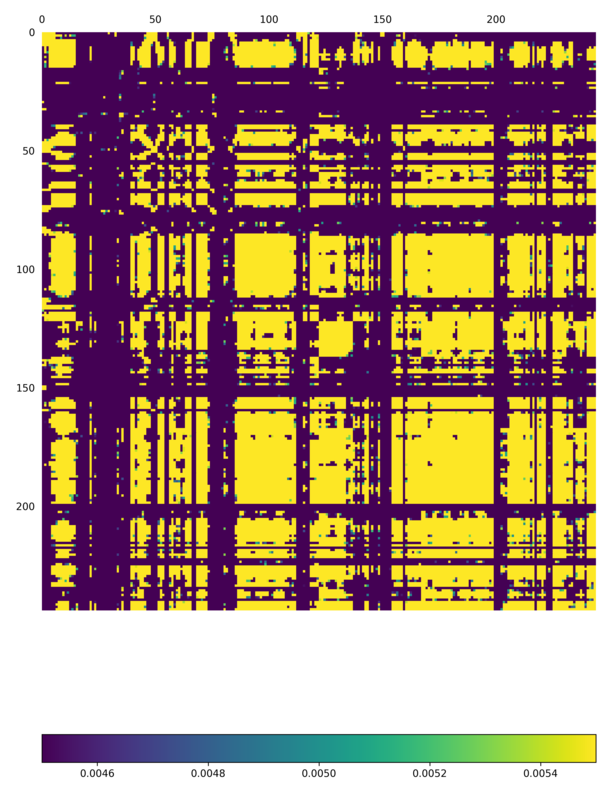 A text file with the overlap and correlation of each mode to the conformational change. The modes are ordered by the absolute value of their overlap. 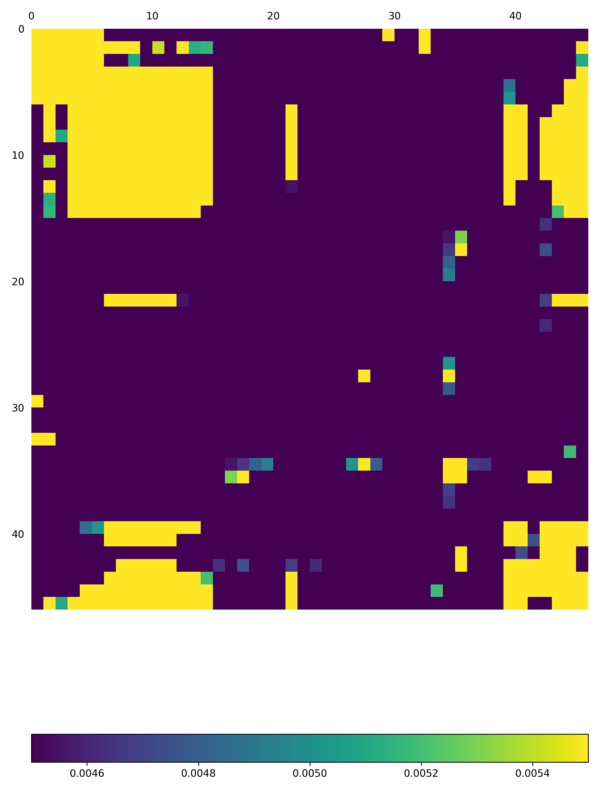 Correlations calculated across 465 common residues (93 per 5 asymmetric units). This option allows to calculate the overlap and correlation to a conformational change, over a combination of modes. In this example, we will use the EV71_CG3 Model and perform the calculation over the modes 9 and 30. A VISUAL PDB file. This can be opened in VMD and visualised as a set of 50 frames. A VISUAL_ARROWS text file. This file contains a Tcl script that can be copied into the VMD TK console. The script plots a set of arrows indicating the direction of each atom. To load the VISUAL_9.pdb file click the following tabs: File >> New Molecule >> Browse >> Select VISUAL_9.pdb. We will demonstrate each of the above options using the EV71_CG4 model. Here we will visualise the motion of asymmetric units 1 and 3. 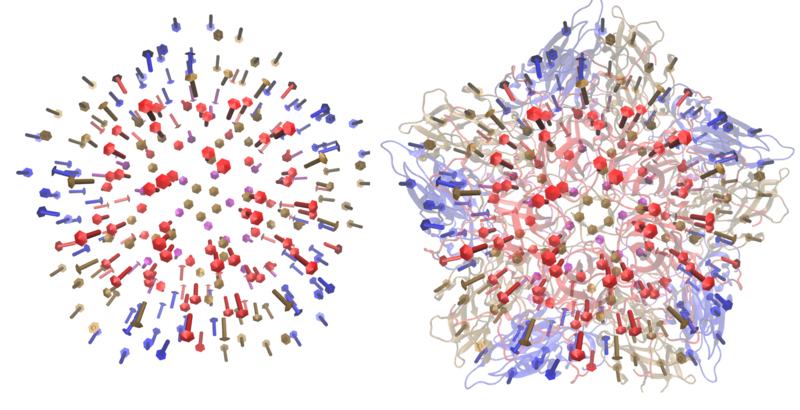 The motion will be captured in the frame set: VISUAL_AUNITS_9.pdb in the Tutorial folder, and can be played in VMD. the MSFs of the CB atoms for a specific mode, or a specific range of modes. The script also allows for comparison of MSF obtained from modes of different models. We can use the –pdbConf2 parameter to send the script a second PDB model. The script will then calculate the MSF of atoms corresponding to residues that are common between both models. In this tutorial, we will analyse and compare the MSF between EV71_CG4 and EV71_CG3. This will give an indication as to whether or not the higher coarse grained model is also suitable to study the virus. 3) PDBCompareCommonResidues_msf.txt: overal MSFs for residues (of CG4) common to CG4 and CG3. 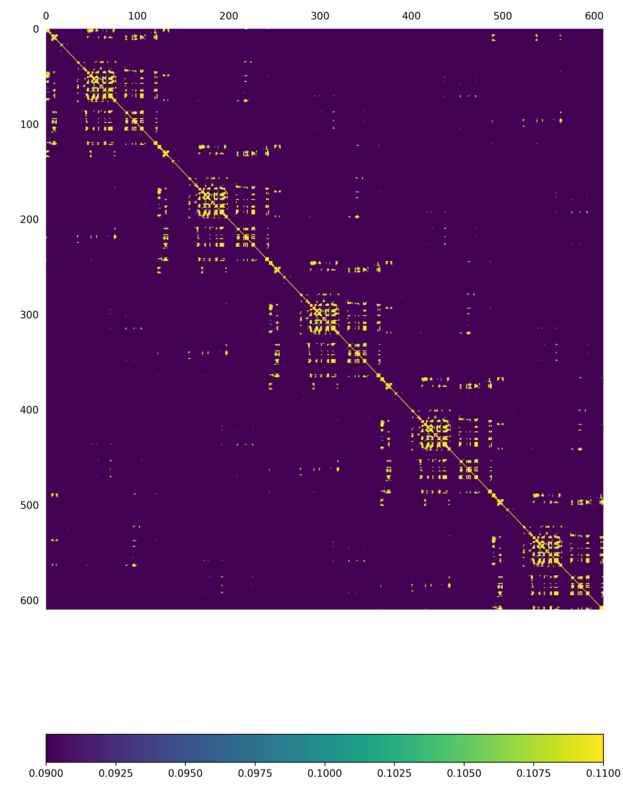 Now, we will use the assemblyCovariance.py script to calculate to plot various covariance matrices of the complex. For this example we will use the EV71_CG3 Model. Now we will use the additional options to calculate the covariance for mode 7 only (the first non-trivial mode). We will also plot the covariance between the asymmetric units 1 and 3, and then zoom into chain A of the first asymmetric unit. We have also adjusted the values of the axes to increase sensitivity for a single mode. The above function will produce a plot corresponding to the full model for mode 7, a second plot that zooms into covariance between the first and third asymmetric units, and a third plot for the covariance of Chain A and Unit 1. For each of the steps above, the script also outputs each covariance matrix in txt file format.